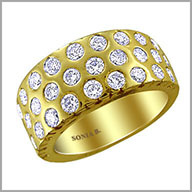 LongDescriptionCrafted in polished 14K gold, this ring features 31 full round cut diamonds in burnished settings. There is also an undergallery for added beauty and comfort. The total diamond weight is approximately 1.86ct with a color of HI and the clarity is SI. The setting size is 13/16" x 5/16" with a height of 1/8". I absolutely LOVE this ring. I purchased it in yellow gold about 4 years ago (?) but really wanted it in white gold which at the time was unavailable. For the past year or so I have been looking for this ring in white gold but have never been able to find it. Finally today I found this site AND the ring! I will be ordering it soon! This has to be the most beautiful ring I have ever seen or owned. I always receive compliments on it.